Some 30 km (20 miles) south of Lake Baringo, as the ruddy ducks flies, is Lake Bogoria National Reserve. This small equatorial lake has geysers and hot springs. There are relatively few vantage points from which you can see it but its topaz and green waters are strikingly beautiful. The Maasai know Lake Bogoria as Mbatibat. 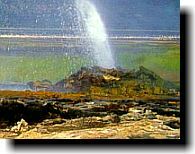 Along Lake Bogoria�s western shore is a bed of hot springs and blowholes, which infrequently erupt 2.5 to 3 meters (8 to 10 ft) into the air, and constantly emit a pungent sulfur smell. This geothermal phenomena is intriguing but also dangerously hot.